Separation of Church (organized religion) and God...maybe that should be the subtitle to this book. Having programmed into our spiritual DNA the concept that God and the organized institution of church cannot be separated, we've done ourselves a huge injustice. There are scores and scores of people out there who resent and abhor Christianity while mocking the thought of an omniscient being who created the heavens and the earth. Why? Are they stupid? Are they in denial? Are they perverts trying to escape the moral and ethical values which constrain their thoughts and desires? Or, are they pragmatic realists who have tired of the process of watching Christian communities implode through the fostering of intolerance? Haven't we, Christians, proven time and time again that we can be very manipulative, self-serving, self righteous, condescending, arrogant, apathetic, and irrelevant? Now, I'm not suggesting that this is an accurate description of all of our communities or individuals, but to the scores of "anti-Christians" it doesn't matter. Whine as we might about the "unfairness" of their conclusions, we cannot explain away the despicable behavior of some of our wayward brethren. See, as long as we insist on promoting the idea that a relationship with God, the Father, is in some way contingent upon and facilitated by our involvement within an organized system of religion (be that a church, or denomination, or any type of extraneous organization) we are promoting the idea that God and that organization are one and the same. The reason it is so important for someone like Anne Rice to come out in defiance of the continuation of this system-godhead consortium in her own life is that those of us Christians uncomfortable with the traditional system-godhead can begin to speak out in defiance as well. 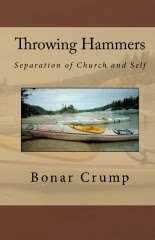 Furthermore, as long as God is consistently presented as a conjoined twin with the religious institution of church, if a single Christian community calling itself a "church" behaves despicably then the "anti-Christians" have every right to reject God as a ridiculous combination of mysticism and frivolity. The sidenote to this topic is that a great deal of the "churchy" advice given to a Christian who staves off involvement in organized religion is that one shouldn't let the behavior or demeanor of offending "church" members be used as an excuse to flee from the congregation. More often than not, a congregational member critical of other members or cliques within the "church" is told to focus on their own relationship with God and not use other's misgivings as an excuse to "turn from God". This is inherently flawed reasoning at a very basic level. First, one is told that the well-being of their faith is dependant upon their involvement with the "church." Next, one is told that their involvement within the "church" should not be contingent upon other members' bad behavior. Finally, one is told that if said bad behavior is a deterrent to their continued committment to the "church" then they should focus on the core value of ensuring the well-being of their faith---which, as we established before, is supposedly dependant upon their involvement with the "church". I'm not making this up! This circular reasoning is one of the fundamental reasons for the current crisis of confidence in Christianity and Christian religious institutions. Circular Reasoning – supporting a premise with the premise rather than a conclusion. "Imagine a woman, destined for greatness. Let's call her Charity. She's beautiful, she's talented, she's kind, sweet, likeable--potential oozing out her pores. Like I said--destined for greatness. She's engaged to this incredible guy, and everything seems to be perfect, going her way. She has bluebirds circling overhead, a bounce in her step, a whistle on her lips, a twinkle in her eye. And then somehow, she takes a very wrong turn. What started out as small chinks in her perfection led to bigger missteps--a white lie turned into shoplifting, turned into heavy drinking, turned into casual drug use, turned into selling herself to keep her habit. The bluebirds became vultures. The bounce became dreary shuffling. The whistle died, the twinkle dulled.